Hi everyone! Amy Prior back today to share some more inspiration using the fabulous new A2Z Scraplets kits. 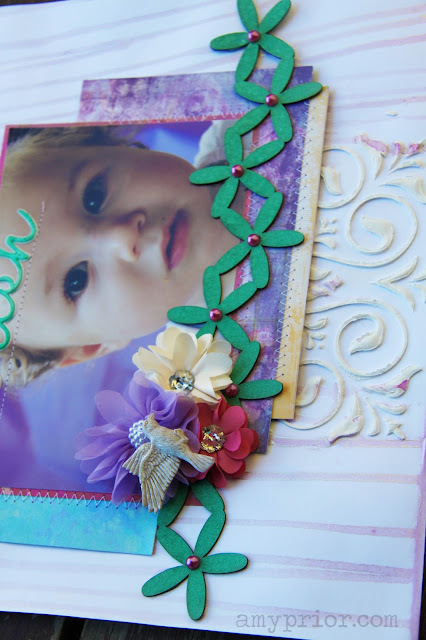 Today I have some layouts created using the Firefly collection kit which you can view here on the website. You can also purchase the kit without sprays if you have lots at home just click here to view the kit without sprays included. My first layout I have created by sticking various Paper Doilies in varying shapes and sizes to my white cardstock and then adding Mod Podge over the top. I have then masked and sprayed some paint mist randomly and embossed randomly also. I have then used some scraps of patterned paper that I had left over from the kit and have mounted my photo and distressed all the papers and the photo. I have layered some ripped and torn cheesecloth from the kit between some of my layers to add some more fun texture to the layout. Next step was to add some of the gorgeous flowers from this kit onto my layout. I have created 2 little mini clusters of flowers all from the kit and I have also added some of the little Prima Baubles that were also included in the kit. I added some of the ripped threads from the cheesecloth to my flower clusters then stuck down some sequins randomly and the Pink Paislee Butterfly and pearls that were in the kit and I was finished. I went to my alphabet stash to create my title. Extra products used on top of kit contents include: Extra Paper Doilies, Embossing Powder, Lindy Stamp Gang Mists, Alphabet Stickers. This next layout was super quick and fun to create. I still had tonnes of cheesecloth left over from the kit so I have covered an entire piece of white cardstock from the kit with the cheesecloth using some Mod Podge. When this was dry, I have dripped some of the Heidi Swapp Mint Green Mist & the Dylusions Bubblegum Pink from the kit randomly over the background. Next I have grabbed this fabulous A2Z Scraplets Chipboard title and sprayed the top half with Heidi Swapp Mint Green Color Shine as well as Dylusions Bubblegum Pink both from the kit. I wanted the colours to mix very slightly so I have sprayed really close to the chipboard and the best bit with these mists is that you don't have to prime the chipboard YAY! Seriously you could if you wanted an even more vibrant colour but man I am lazy and man they look vibrant enough for me. Extra products used on top of kit contents include: A2Z Scraplets Chipboard Title, Prima Marketing Alpha Stickers. Next layout you may have already seen, it is called Cherish. To create the background, I have used the mask from the kit with some Modelling Paste to create a strip down the centre of my page and I have used my heat gun to dry it so that the modelling paste puffs up even more. What can I say, I love me some texture lol. Next step was to dribble some subtle mist over the entire page. The mists in the kit were a bit too vibrant for what I was aiming for this one so I have used some old Glimmer Mist from my stash and a medicine dropper to create this fun pinstripe dribble effect. As you can see, the modelling paste definately got in the way of my dribbles and it would have probably been smarter to dribble BEFORE adding the modelling paste but hey that is just not how my creativity works. Next I have sprayed the Chipboard Scraplets Daisy Border with the Heidi Swapp Mint Green Color Shine and I have added some Flourish with a Bling pearls which were also from the kit. All flowers and shabby resin bird were included in the fabulous kit. Don't forget to click over here to view all the awesome kits designed by yours truly now available from A2Z Scraplets. Extra products used on top of kit contents include: Glimmer Mist Rose Pink, Pink Paislee Artisan Word, Modelling Paste. 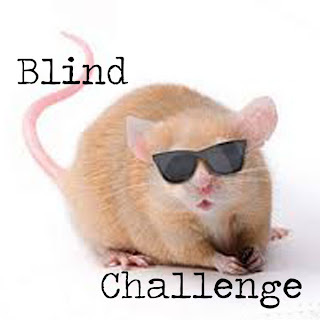 Don't forget to join in my Blind Challenge this month for your chance to win yourself some awesome free Scraplets! Seriously it is so much fun and the chance of free stuff just sweetens the deal so I urge you to all give it a go. Click here to find out the details of the challenge. Well I hate to love you and leave you but that is all from me today, I am certain that I have been talking way too much, I hope you all have an amazingly fabulous day and don't forget to vote all you Aussies out there reading.